← Enjoy MP4 Files on Windows Media Player—Best Methods Offered! Wonder how to make it possible when enjoying the MKV files on Chromest with Plex server? Just relax and next we are going to discuss how to smoothly get rid of the troubles of streaming MKV videos to Chromecast through Plex server. Any personal MKV solutions there? As a media server application, Plex enables us to share music, movies on TV, PS3, Xbox360, Android, or Apple devices, etc locally via home network connection, or remotely, as long as you have a Internet connection. The point here, you will find it a painful experience to play MKV files via Plex. Cause the Plex itself has the limited supported formats, it refuses not only MKV, but also others like AVI , etc. The good news is we can work Plex server to play any videos on Chromecast nicely. After searching online, we all know that MP4 shows up with no problem with Plex. In this case, why not we convert the MKV to MP4 as the playable video format for Plex server to make them nicely playback on Chromecast? Fortunately we are going to offer you two efficient ways to fix the issues. Two solutions are listed below you can take a good reference. Solution 1. Make sure the whole file names were being recognized by Plex. For example, if all of mkv videos are all Sports videos so the names, there were kind of random. To solve it, you can set ‘Scanner’ as ‘Personal Video Files Scanner’ and ‘Agent’ as ‘Personal Media’. Plex picks up pretty much any file with that setting. However, I found it’s stuttering on large MKV files Plex. Solution 2.To make MKV nicely accepted by Plex and playback on Chromecast, Pavtube Video Converter for Windows can solve the problems well. It is a professional MKV to Plex converter which can encode MKV to Plex Server with the suitable supported formats without quality loss. In addition, it not only supports MKV videos, but also handles various common video formats, like VOB, AVI, MOV, TiVo recordings, MPG, WMV .etc. 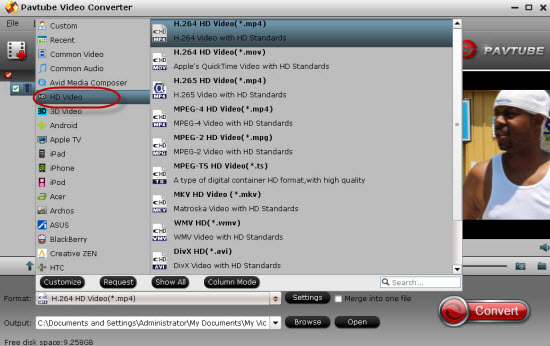 Click “Add Video” button to load your MKV files to the program on the main interface. You can also directly drag and drop your videos to it. Step 2.Come to the output list by hitting the ‘Format’ bar on the left of the preview window, here we suggest you to select the ‘HD Video’>>’H.264 HD Video (*.mp4)’ as the best output one. At the end, go back to the main interface to click the ‘Convert’ button, without waiting for a long time, you can get the output result. Here, when you wanna enjoy watching MKV movies on Chromecast via Plex again, are you still worrying about the incompatible format problems related to MKV? Let’s go! GoPro Video Plays Troubles with Plex—How to Solve?